8.30am: I am woken by a loud fart. I’m surprisingly clear-headed (which might mean I’m still pissed). I try to sleep some more, attempting to ignore the man smells around me. 9.30am: Breakfast. I’m desperate for a bacon sandwich, instead I get the European equivalent: bread rolls and slices of ham. 10.30am: Leave hotel, no time for sightseeing, but time to stop at Bier Temple to pick up a couple of interesting bottles. 11.15am: To Cantillon Brewery where Pete joins us along with Dominic, Janine and John. We get a tour around the place and it’s stunning. I’m not sure what I expected, but it beats that. 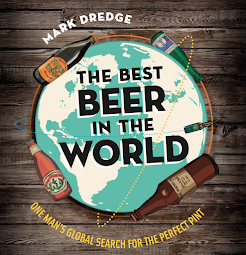 It’s small but it just feels like the best brewery in the world; the cobbled stone floors, the old bottles, the giant wooden barrels of beer, the brewing equipment; it feels like you need to step delicately so you don’t disturb anything, it seems like it creaks and groans and lives. There’s a real magic to the place, a soul. At the top is the Coolship (which sounds like a 70s blaxploitation film set in space, if you ask me) where the beer is pumped into a large, flat tray-like vessel which is opened to the wild yeasts in the air through slats and holes in the roof. 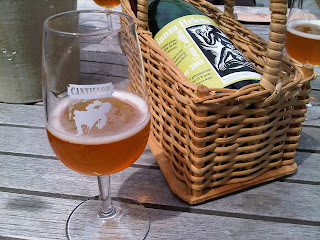 This is what makes Cantillon, Cantillon (the Homebrew Chef has some great pictures of the brewery here). We get to chat to Jean Van Roy, the brewer, who opens bottles for us, including a lambic aged for five years in a cognac barrel which was only bottled in April 2010 and won’t go on public sale - a very rare treat. Like a proper tourist I buy a t-shirt, a glass and two bottles of Cuvee St-Gilloise, the renamed version of Cuvee des Champions, which is delicious. Pete offers around a bottle of his own barrel-aged with cherries experiment (which he very bravely offers to a master of this type of beer) and it’s really good. Cantillon is a rugged and beautiful place and I could stay in awe for hours. The only strange thing was the group of Dutch guys wearing bright orange cowboy hats and the coach-loads of people who arrived for tours, seemingly having never tasted beer like this before (you should’ve seen their puckered faces – what is this beer?!). 2.30pm: Arrive at De Heeren van Liedekerke for beer and lunch (we leave Dominic, Janine and JC in Brussels). This place is fantastic; a restaurant with seating outside, excellent food and a vast beer list unlike anything I’ve seen before, including a huge selection of vintage beers. A bottle of Cantillon Crianza Helena (a special blend only available in this bar) and four plates of delicious beer-soaking stodge come our way. They even inflate a bouncy castle but sadly there isn’t enough time and as much as we'd love to stay all afternoon we have somewhere to be. 4.30pm: We arrive at the Weekend of Spontaneous Fermentation and meet the others again. Lambic and gueuze in a small hall with lots of friendly people; a beer festival unlike any other I’ve ever been to. Fantastic, unique in so many ways (deserving of its own blog post). There was some excellent beer here, the pick of the lot was a 3 Fonteinen Schaerbeekse Kriek, made exclusively with the eponymous cherries giving the most delicious depth of fruit. 8.30pm: Back to Brussels and to Moeder Lambic. More IV Saison, confirming it as one of the best beers I’ve had in Belgium, and a Valeir Extra, a punchy blonde with big US hops. Toe-tapping jazz plays at the back of the bar while we flick through the long beer list. We continue to search for attractive Belgians but remain unsuccessful (they are, however, all lovely people). 10.00pm: Next stop: Les Brasseurs de la Grand Place (watch out, their website plays some annoying music), a brewpub directly off the Grand Place. There’s handsome brewing equipment as you go in, but the beers really disappointed; well brewed just lacking flavour (and expensive too). We leave, back into the bustling centre, made even busier thanks to the large stage set up in the middle of the Grand Place, playing more jazz – there’s nothing like jazz somewhere like this, it’s cool and relaxing, but funky and uplifting, perfect drinking music. 11.00pm: One in the Hoppy Loft, another Hornbeer, this one the Happy Hoppy Viking, which disappointed – a triple IPA but just a mess of hops (to use JC's term, the brewery seem a bit of a mine field - some brilliant, some a little less so, but I still want to try more). Still no good-looking Belgian women and we finally give up hope (further searches reveal that this is the best looking woman in Belgium). 12.00am: Back to the hotel because we have an unfeasibly early start after a weekend of drinking. Outside, below our hotel window, the party continues until we wake up. 6.00am: Woken up. Zombie-like we leave and Phil drives us back. I have two packs of crisps and a banana for breakfast. With four guys who have been drinking all weekend and eating junk food, the van fills up like a hideous gas chamber. 11.00am: Exactly 53 hours after leaving on Friday I return home and slump down on the sofa, after carrying a rucksack, a small suitcase and a box of beer from the station to my flat. I spend the rest of the day either looking at the bottles of beer I brought home or sleeping. A whizz-bang tour of Belgium, enough for a flavour, but giving the taste for more. We had some fantastic beers in some great places. Cantillon is a huge draw and should be a must-visit for anyone in Brussels. I need to go back now and do it all again, plus I have a feeling that I’ll be craving IV Saison all summer. And did someone mention a Brussels Twissup? "Still no good-looking Belgian women and we finally give up hope"
That's because you looked for them in the center of Brussels, where there are only tourists ;) ! Of course, I'm only jesting about the fine women of Belgium, my eyes never strayed from either the beer taps, a beer bottle/glass or a beer list. Of course. "Beer Taps" is that some sort of rhyming slang for baps? I would recommend the Cantillon brewery to anyone visiting Brussels - beer nerd or not - it's cheap, unique, fascinating plus you get a tasting inclusive of 5 Euro. We spent 3 full days in Belgium in Feb & I had probably one of the worst hangovers on the journey back as I have ever had in my 34 years owing to trying as much beer as possible. Paradise.